I got a buttload of 260 brass that I need to anneal and hope to start this week. Very useful video. I'm using the same setup and caliber brass. However, my time is at 3.8 sec compared to their 3 sec. I do use a slower flame speed so I believe that is the reason why. Orkan, do you use tempilaq or go strictly by what your sacrificial cases tell you? Stricly what my cases tell me. Each case has slightly different alloys in it. Temp paint does not tell the whole story. As for flame height, yeah, I'd go a little lower on those. You want to get about 1/4 way down the case from the shoulder. Keep the torches level, (not angled) and the flames crashing into each other at the mid-point where the brass sits. [HR][/HR]I use temp paint on the head to keep me from overheating. The neck gets what the case tells me. I use a couple of throw away cases for testing. My R-P 260 brass is about 3.8 seconds also. There is no uniform answer for how long you need to anneal because of differences in brass and flame temo. I clean all my brass in SS media before annealing. After I resize I use corn cob for final finish and removal of any lube left from the sizing process. THe video is quite decent and you give some good pointers. For anyone that is starting out annealing, the first thing i'd advice to do is simply read up on some good information, so you atually have a grasp of what your actually doing and want to achieve. here is a few decent ones. As for adviing people not to use Tempilaq, because cases does not have the exat same metallurgy is really not a sound advice. First off you should ensure that your case neck get to a high enough temperature, for the brass grain structure to change sufficiently, witch is what you want to achieve in the first place, and that certainly wont happen below 600 F, regardless of metallurgy. Secondly using too high a temp will permanently ruin your brass even if it is just for a few seconds. The Tempilaq will give you some very good indicators as to what is actually happening with the brass. Using both your eyes and Tempilaq is highly adviced, if you want to do it correctly. That's your opinion, and you are happy to voice it. Though it is just like every other bit of annealing advice given in most places: Overly complicated. Each brand of brass and each lot number from those manufacturers will react slightly differently. The point at which they start burning off metals from the alloy will vary in time, but the point just before that is correctly annealed. Period. You say "regardless of metallurgy," but that's the entire topic at hand. I had my process vetted by a professional metallurgist that works for one of the worlds largest oil companies and makes ridiculous money. He knows more about brass alloy than anyone I've ever talked with in my life. If you want to use your paint sticks, go right ahead. People following my method will experience a faster setup time and a certainty of process that they would not experience otherwise... and it's easy to do. You quote specific temperatures, yet say that every brass is different. That doesn't track does it? My process allows you to identify what each type of brass specifically behaves like. Finding exactly where you start ruining the brass, and allowing you to back off from it to ensure a perfect annealing temperature every time regardless of brass type. There IS no better method. I've spent several years looking for one, and no one has written anything or produced any evidence of it. I've been advocating this type of setup for the last several years, and those that heed the advice report back with excellent results every time. [HR][/HR]Thanks orkan, Just annealed 50 of my oldest cases. 12 firings on them, sure made a difference when I sized them and bullet seating feel was a lot more consistent. Went outside and shot 2 groups of 5, didn't hurt anything but that brass was showing vertical issues at distance. Looking forward to trying them past 1000. 5 seconds with single torch, Win 243 brass sized to 260. Excellent! Anneal about every 3 firings or so at least, and you'll have more consistent release. I have a machine, so I anneal every firing... because it's easy. Do you anneal before or after resizing? I would guess before. Anneal before resizing. The heat will tend to move the metal around a bit as it's being stress releived, so sizing will get them all uniform again before trimming. Awesome video Orkan, I wish I saw this when I first started out. A few years ago (even now) there's a bunch of misconceptions and I learned the hard way (standing cases in water, heating till red, drying in the oven, and what not...). Orkan, what's your opinion of dropping the cases in water after annealing. Seems like some do it and some don't. Does it matter? Great vid by the way. Doesn't matter at all. I don't quench. And the reason not to quench is simply that the brass is thin enough and the batches are large enough that the brass is cool by the time you are ready to begin the rest of the process? Now I have also heard some shinanigans about you shouldn't quench brass becuase it would work harden it, but from what i understand about brass is that you will not recieve really any hardening in the brass since brass work hardens only when being cold worked yea? Just thought you guys might be interested in my homemade annealing machine. Very good information. I am trying to decide on what the best annealing machine or method to start with. May start out with tempilaq, cordless drill and propane torch as I have everything. Any opinions on best annealing machines for weekend warrior and cost? IRT: "I'm using the same setup and caliber brass. However, my time is at 3.8 sec compared to their 3 sec. I do use a slower flame speed so I believe that is the reason why." Isn't the real question: what temperature for how many seconds? I'm looking for numbers on different calibers and even different manufactures to know how long and at what temperature to run my .223 Lapua brass through the home made annealer. Does anyone know of sources for this info? Thanks! If you listen to what is said during that video, you will see that you are not asking the right question. Each type of brass is different, and each flame type and conditions are different. So, if you use the method I describe in the video, it will account for all of those variables and ensure proper annealing. Time and temp vary. The moment a specific piece of brass is correctly annealed, is shown by the flame color change which comes after it. Simple, and effective. If you read this thread and watch that video, all of the answers are right there in front of you. Having spent hundreds on Lapua Brass I've decided to go a little further down the rabbit hole on my reloading process. Take a look at the Annealing Made Perfect product. A little pricey, but I wont destroy my investment in the Lapua Brass. How about salt bath annealing? I saw once, but seems to be more consistent than propane annealing. You need to mess with hot liquid, gloves etc. If this is not a problem for you, than try. I think induction is similar as a result, but much more expensive. I went the same way for the same reason. The Annealing Made Perfect machine is SO easy to use! I also can't imagine a more precise way to setup and anneal brass. 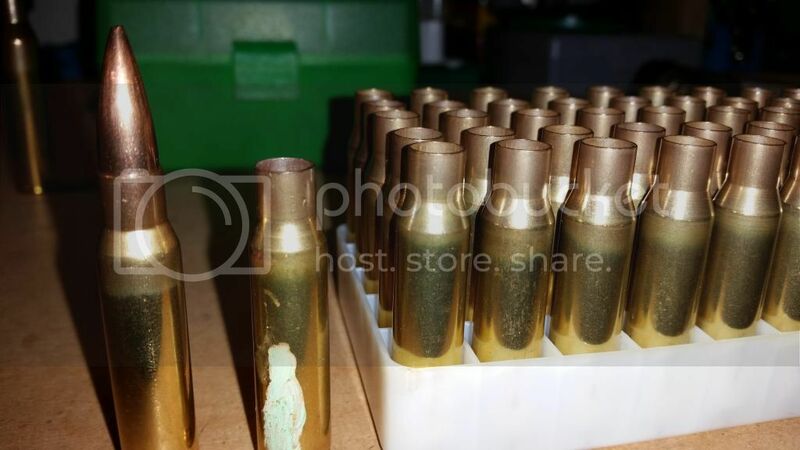 They evaluate each lot of brass in each caliber and examine the stuff under a microscope to determine the perfect settings to achieve the optimal hardness. The machine is expensive but if it can double the life of just the 500rds of Lapua 338LM brass I bought this year it will pay for itself and I'll use it on a lot of other calibers too. I'm really looking forward to seeing if consistent annealing can lower my SD's and help increase accuracy. Hi guys. Tangental question. I had an empty shell fall into the wood furnace before i started reloading, or knew anything about brass. It spent some time in there before it was fished out. It has since been tumbled and prepped with the rest of my brass and i cant tell which it is by looking at it. So I have 2 questions. First is there a way to tell which it is? Any test? And second if it does get loaded and fired, it it going to turn my gun into a bomb? Be harmless and just blow gasses out the vent hole? Or something in between? Basically just trying want to know if i should load them all super light and try to find it, or if its not worth the risk... i appreciate any help. Also sorry if this should get its own thread. Wanted to try here first. At what point in your reloading journey did you decided to starting annealing and how much more life can you get out of your brass? I am just starting out with reloading rifle ammo for my new .308 and have saved my Federal brass I have shot so far (100 cases). As far as increased accuracy and lowered SD's, I'm still looking forward to some good range time with a chronograph. I loaded 50rds of the same load, same components annealed and unannealed so maybe I'll see some difference or not. Lot's of testing ahead for me. I do know of some very serious competitive shooters that anneal after each reload and I put a lot of credence into their recommendations, hopefully their advice will help my accuracy too. Good luck with your reloading! I began annealing when I noticed the neck tension diminish after about 5-6 firings. I annealed with a propane torch and a socket and neck tension was restored. It was very early on I discovered the advantage of annealing. I do it now every 3 firings usually. I first began annealing 10 years ago with a home made adapter on the end of a cordless screw driver, a small bottle propane torch and a bucket of water. I was shooting Winchester .308 brass for bench rest competition, a little on the hot side but under max loads. I was neck sizing only until the bolt lift started to get a stiff. Decided I needed to anneal before doing the .003 shoulder bump. I managed to get more than twenty firings out of the brass with no signs of needing to be replaced. Since it now gets used exclusively for deer hunting, I only shoot two shots a year. One to verify the scope and one to put down a deer. The 188 loaded rounds I have should last me. I will be changing over to the salt bath method this winter for my Ruger Precision .243 project. I've noticed that the 500 pieces of Starline brass I'm prepping have a lot of variation in neck tension I hope to cure by annealing. I'm switching to the salt bath because; 1) I can process more than one case at a time; 2) it won't reduce the oxygen level with the house closed up tight in the dead of winter; 3) no carbon monoxide; 4) my four legged fury heathen have no manners and thus might tip over my torch after which my wife will grab the fire extinguisher and have to decide if she should use it to assault me first or put out the fire. The wide base melting pot is much more stable and I have a place safely away from pets to use it. 18Echo, You won't regret it! Be aware, if you purchased the 20# capacity lead pot, you'll need to come up with an adapter plate. I fabricated mine from the bottom of a cheap Chinese stainless dog dish. I also invested in an inexpensive $9.00 metronome to count and signal every six seconds. One more thing, I'm going to build a wire rack that holds my cases in two rows at the same width as the holes in the hot bath holder. My idea is to tip it to feed two cases to the front, ready for me to pick up in the groves I ground on the front of a metal spatula. The spatula will assist to remove the brass from the hot bath holder and drop them into the tubes feeding into the nested bucket water quench. That little bit of hot salt on the cases makes a heck of a splatter when it hits the water. I'll be doing my best to confine and control it. I like to tinker, so last winter I ordered a few parts and used others I already had around the house to build an annealer based off the Skips DIY plans floating around on the web. Total cost was around $80. After some minor tweaking it runs perfect and annealing is so easy, it has become a regular part of the reloading process. Have noticed more consistent groups since adding annealing to the steps. Wow these annealing machines are getting expensive. Might have to keep using the cordless drill and propane torch technique for a while longer. I stepped up to salt bath annealing and won't go back! Molten salt heat treating has been around a long time. It's less hazardous than casting lead. Ballistic Recreations in Canada sells a well put together kit with shell holder, instructions, annealing salt and temperature meter with sensor. It's way faster than the torch and drill method. I purchased a digital metronome for $9.99 to count my six second intervals. I also got the 20# Lee lead pot to cut down on having to take breaks to let the salt bath come back up to temperature. I had to make an adapter for the shell holder and 20# pot. I had never heard of that method before but after watching the Ballistic Recreations video it looks very interesting. Might have to give that a try! Broc, several other Hide members have used this system and reported on it. If you search the Hide for 'Salt Bath Annealing' you'll come up with several more threads that have talked about it. Broc, I went through the same decision process and went for the kit since the welded stainless steel shell holder was going to be a bit beyond my skill and resources. The second thing was that the BR kit came as a single shipment. If I had to find and order the salts, meter and sensor separately, I'd have as much or more into the shipping. The instruction booklet that came with the kit was well done and contained additional information I was glad to have. Is annealing that important for prs? I am just getting into reloading and am on the fence for buying an annealer. and suggestions or help? Annealing is important in getting consistency. But if you are just getting into reloading work on the basics first, and get your processes as consistent as possible. Then add annealing to refine. I run an Annealeez which makes annealing very easy and fast so I anneal every reloading. You should be able to get your SD's into the single digits with a good consistent process, then annealing will drive the SD into the low single digits. Annealing really does make a huge difference. A friend loaned me his induction annealer, and I did some LC-66 match cases that had previously had primer pockets uniformed, and de-burred. I used Nosler 175 grain RDF bullets, CCI-BR2 primers, Varget powder with every charge trickled on a balance beam scale. Out of a factory stock TRG-22, I got a standard deviation of 3 fps, and an extreme spread of 11 fps. Before annealing cases with the induction annealer, I had never achieved such consistency, so I was really happy. My friend built his own induction annealer, complete with a water circulation system for the coil so that the coil starts out at the same temperature for every case. I'm having the same success with annealing. I broke down and bought the Bench Source when Brownell's had a coupon. For test brass, I use ones damaged by the gas gun, trimmed to short, loose primer pockets, etc. The Tempilaq works great. It's tempting to go by brass color, but I just trust what the Tempilaq tells me. Occasional tumbling cleans them back up enough to keep reusing. Case sizing and bullet seating have gotten much more consistent which has lead to lower SD's. It's been good money spent. I appreciate all the great info everyone on this site provides.